There are two types of pregnant women: those who feel great during pregnancy and those who are miserable. Whichever you happen to be, pregnancy-safe workouts won’t only help you feel better, they can also help decrease the risk of pregnancy complications. Of course, before you begin any exercise routine, you’ll want to check with your doctor or midwife as they can tell you if your body, and your pregnancy, is healthy enough to incorporate exercise into your daily routine. Once you’re cleared, it’s time to begin exercising. Exercise during pregnancy is important for maintaining health and strength. Though it may, at times, seem difficult to do so, exercise throughout the various stages of pregnancy can be quite simple and beneficial. 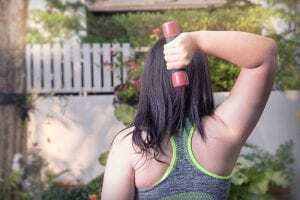 For keeping up a fitness routine that is low impact on the joints and allows for stability, here are a few approaches for upper body exercises using light weights or exercise bands. The thought of getting on the floor for a traditional push-up goes straight out the window as your stomach begins to grow. To modify the push-up for pregnancy, place your hands shoulder-width apart on a wall or elevated surface, such as a counter top. Step your feet back so your body is in an inclined, plank position and slowly lower your chest, keeping your body in alignment. Exhale as you press back to the starting plank position. Boost your energy with simple upper body band pulls that allow for personalized resistance. All you’ll need is an exercise band and a little bit of wiggle room. Standing with your feet shoulder width apart, or sitting up straight, hold one end of the exercise band in each hand. Keep your chest raised and your pelvic area neutral. Then, using your shoulders and upper arms, pull the band across your chest. Repeat this exercise adjusting the height at which you hold the band to provide toning and strengthening to your arms and shoulders. For this exercise, you’ll need to sit in a firm chair with your feet on the floor and evenly aligned with your hips. Hold a pair of weights, 5 pounds or less, in front of your belly button. Then, slowly raise the weights to chest height. Keep your elbows pointed out and away from your body as if you’re rowing. Keep your back straight and relaxed and stop the weights right under your chin. Keep your shoulders strong with light weight lifts. To do this, hold a light pair of dumbbells against the front of your thighs with palms facing in and begin to slowly raise your arms up in front of body to shoulder-height. Keep your arms at shoulder height and open them to the sides of the body forming the letter “T.” Slowly lower your arms to the sides of your body and repeat this routine in reverse. Be sure to focus on the back of your arms to help with overall strength. For this, tricep extensions can be done sitting or standing. Simply hold one or two light dumbbells straight over your head. Keeping your elbows close to the sides of your head, slowly lower the dumbbell(s) behind your head until elbows are at a 90-degree angle. Hold this position for a few seconds and then slowly exhale and press the weights back up until arms are in the starting position, straight above your head. Secure an exercise band to a stable surface at elbow-height. (To do this you can tie the band directly to something like a door knob or railing, or by tying a knot in the end of your exercise band, placing the knot in a door frame and closing the door tight, allowing the knot to hold the band in place). Stand next to the band and hold the end of the band firmly in the palm of one hand. Keeping your arm at a 90-degree angle and your elbow in toward your ribs, pull the band across your body and slowly returning to the starting position. To give your arms a complete workout, sit on a sturdy chair with your feet flat on the ground. Grab two light weights, one in each hand, and form the letter “W” with your arms. Your arms should be wider than your shoulders and elbows bent and pointing toward the ground. In slow pulses move the weights up toward the ceiling, continuously keeping a “W” shape. No matter what exercise you choose, it’s important that you listen to your body. If any exercise makes you feel dizzy or otherwise “wrong,” stop immediately. As with any physical activity during pregnancy, be sure to consult with your doctor prior to participating in any exercise routines and ask for exercise suggestions. He/she may be able to recommend specific exercises which will help ensure that your little one is positioned just right for labor and delivery. Keeping your upper body strong during pregnancy is absolutely possible and can it can help you feel energized throughout your pregnancy, making you feel all the more ready when your new addition arrives. Plus, once the baby arrives, you can continue to work on those arms and keep them strong for every exciting moment to come!